Remote sensing satellite. Imager provided a resolution of 2.5 m in a 20 km swath and 12.5 m in four spectral channels along the same swath. A separate imager provided optical resolution of 25 m in a 250 km swath. Earth Observation satellite built by NPP VNIIEM for Roskosmos, Russia. Launched 2012. Used Kanopus bus. AKA: BelKA;BKA. Status: Operational 2012. First Launch: 2012-07-22. Last Launch: 2012-07-22. Number: 2 . Gross mass: 473 kg (1,042 lb). Kanopus-ST 1 Earth Observation satellite built by NPO VNIIEM for Roskosmos, Russia. Launched 2015. Used Kanopus bus. Kanopus-V-IK 1 Earth Observation satellite built by NPO VNIIEM for Roskosmos, Russia. Launched 2017. Used Kanopus bus. Koronas-Nuklon Science, galactic radiation satellite built by NPO VNIIEM, Russia. Used Kanopus bus. Family: Surveillance. Country: Belarus. Launch Vehicles: R-7, Soyuz-FG. Launch Sites: Baikonur LC31. Bibliography: 12711. 2015 December 5 - . 14:09 GMT - . Launch Site: Plesetsk. Launch Complex: Plesetsk LC43/4. LV Family: R-7. Launch Vehicle: Soyuz-2-1V. Cosmos 2511 - . Nation: Russia. Class: Surveillance. Type: Surveillance satellite. Spacecraft: Kanopus. Decay Date: 2015-12-08 . USAF Sat Cat: 41098 . COSPAR: 2015-071A. Apogee: 694 km (431 mi). Perigee: 685 km (425 mi). Inclination: 98.20 deg. Russia carried out the second launch of the Soyuz-2-1V rocket, carrying the 440 kg Kanopus-ST military satellite as its primary payload. Kanopus-ST carried optical, infrared and microwave imagers to test technology to locate submerged submarines. The two-stage core of Soyuz-2-1V reached a 208 x 681 km x 98.2 deg transfer orbit. The Volga upper stage coasted to apogee and at about 1503 UTC made a circularization burn to reach a 684 x 693 km sun-synchronous orbit. 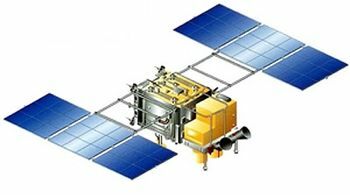 The KYuA-1 satellite was successfully ejected at about 1540 UTC, but one of several latches on the Kanopus-ST failed to open, and the payload failed to separate.The two payloads were given the public cover names Kosmos-2511 (Kanopus-ST/Volga) and Kosmos-2512 (KYuA-1). Following the failure, at about 0200 UTC Dec 6 the Volga reignited in an attempt to deorbit the Kanopus/Volga stack and prevent it becoming long-lived space debris. This burn reached an orbit of 106 x 655 km. Natural orbital decay from atmospheric drag quickly set in. On Dec 7, with the orbit at 90 x 348 km, the spacecraft split into two pieces, possibly but not certainly the Kanopus satelite and the Volga stage. The two pieces reached an orbit of 88 x 297 km on Dec 8 before reentry.